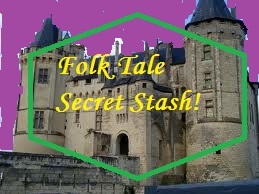 Fairy Tale Fandom: Folk Tale Secret Stash: The Youth Who Went to Learn What Fear is. Folk Tale Secret Stash: The Youth Who Went to Learn What Fear is. You know, sometimes you just have to indulge in some fiction that’s . . . well . . . stupid. While I am all for intelligent, thought-provoking literature, I’m also a big fan of just indulging in some mindless entertainment. What season is better for this than summer? It’s the season to go to the movies and watch big, dumb, splashy blockbusters. It’s the season to go to comic book conventions and buy up all sorts of comics from the days when comics were disposable literature for kids and teenagers. It’s the season to lie on the beach and read cheap romance and mystery novels. In fact, I’d argue that some amount of junk literature is good for you. Writer Peter Dickinson has even come to the defense of junk literature in regards to its effect on children in his blog post “A Defence of Rubbish”. Now, it’s a completely different cultural landscape today than it was when folk stories started circulating. So, I don’t know if folk literature has an equivalent to the dumb summer beach book. However, if they did, it would probably be some sort of fool story. Ah yes, the fool! One of the great folkloric archetypes. Those unassuming types who succeed through some combination of naiveté and dumb luck. 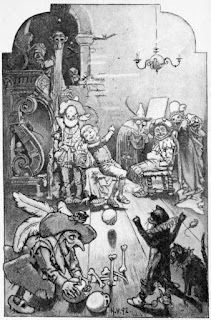 In folklore, supposedly there are whole villages populated by nothing but fools, like the Polish town of Chelm in Jewish lore or Gotham in Nottingham, England. Usually these characters sport average unassuming names like Jack, Hans or Ivan when they’re named anything at all. Now, it’s not to say that a fool story can’t have clever bits to it. One of my favorite fool stories has a rather clever set-up to send the main character out on his adventure. In fact, it’s that set-up that earns this story its title: “The Youth Who Went to Learn What Fear is”. 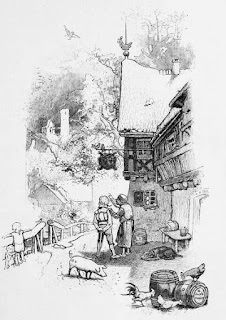 For the record, this one’s another tale from the Brothers Grimm. Our story begins with a man who has two sons. The older son is smart as a whip and capable of a great number of things. The younger was a fool who didn’t seem to be particularly good at anything. Now, whenever the older was asked to run any errands after night fell he’d say “No, the darkness makes me shudder”. Or when people would tell ghost stories by the fire, he’d say “That story makes me shudder”. Now, the younger son was puzzled by this. He had never shuddered in his life and was pretty sure he didn’t know how. The way he saw it, it was some sort of art that he didn’t know how to do. So, when his father asked him what trade he would like to learn in order to earn his own fortune, he’d say “I would like to learn how to shudder”. Naturally, his father was less than pleased. The father explained his troubles to the village sexton. The sexton told him that he’d put his son to work and teach him to shudder at the same time. So, our nameless protagonist went to work ringing the bell of the local church. One night as he climbed up to ring the bell, he saw a figure in white standing near the sounding hole. It was the sexton dressed as a ghost trying to teach the boy how to shudder. Now, the thing is that our hero did not take him to be a ghost. Instead, he figured him to be some kind of thief or troublemaker lurking about at night. So, the boy shouts to the sexton to identify himself or else he’ll throw him down the stairs. The sexton says nothing, figuring that he’s bluffing. The youth asks two more times with no response. So, what does he do? He throws the sexton down the stairs. Then he rings the bell and goes back home. The next morning, the sexton is found at the bottom of the stairs with a broken leg. Our hero’s father is not happy. He gives his son fifty talers and tells him to hit the road. Furthermore, he tells his son to not tell anyone where he’s from or who his father is in hopes that he’ll live this down someday. The son, with what he perceives as his father’s blessing, vows to go off into the world and learn how to shudder. So, he takes him up on that. Now, our protagonist doesn’t quite seem to understand the situation of the seven hanged men. The situation of them being dead, in fact. So, while he sits cold by his campfire, he figures that the men hanging from the tree must be positively freezing. So, he decides to take them down and warm them by the fire. However, once a spark catches on one of the dead men’s clothes, he figures that they’re too stupid to keep from getting burnt and hangs them back up. The next day he meets with the fellow who tipped him off to the hangman’s tree and tells him that he surely hasn’t learned anything and how he’d never learn anything from people so stupid that they’d let their clothes catch on fire. So, he left with his wallet still full. Now, I think this is enough to really communicate our protagonist’s unique character and unique quest. Believe it or not, this is just prologue. The real main event comes when he finds out about a haunted castle. Naturally, the king is offering his daughter’s hand in marriage to anyone who can stay there for three nights. So, our dim-bulb protagonist, who’s likely more interested in learning to shudder than marrying any princess, decides to give it a whirl. He does so armed with only a fire, a lathe and a woodcarver’s bench with a knife. I won’t give anymore away, but you can read the story right HERE. Okay, maybe I will tell you that a scene like the one below happens. What I like about this particular fool story is the character’s stated goal. While most Jack tales and other tales of the sort have a protagonist who is simply going off to “seek his fortune”, this story has a main character with a very specific stated goal of learning something. This task, though, is of course a fool’s errand. And while he does learn how to do it in the end, shuddering was maybe not as useful as not shuddering in the grand scheme of it all. For those who are Henson fans, you may recognize this story in that it was adapted into the “Fearnot” episode of Jim Henson’s The Storyteller. The thing I love about the Storyteller adaptation, other than just how well told it is, is the facial expressions of the main character. Half the time, he has an expression that reminds me of an excited Labrador retriever. So, there we have it. Our dumb yet kind of clever summer folk tale. Pop the popcorn and sit down to enjoy the tale in good fun. Until next time, I’m the Fairy Tale Geek. I hadn't read this story before, but it definitely fits the fun summer read category. Thanks for sharing! Also, to be honest, I can't think of that may other fool stories, either. One which springs to mind is Ricky with the Tuft which I love, because the main protagonist in that is rather assuming and has a lot to learn by the end. Will have to do some digging for more. No matter how much you read/study fairy tales, there's always more. That's part of what I love about them! What a coincidence: At the moment I'm preparing a presentation on fairytales and fear for college and this tale is one of the exampes I'm going to use. What I like about this tale is that is is a spoof. 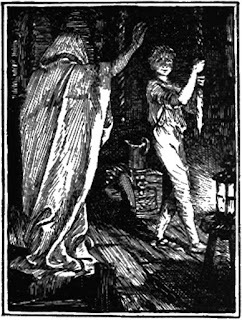 Classic horror elements from oral tradition (the moving bed, undead skeletons) are utilized but then contrasted with the protagonists completely unexpected reactions, the protagonist shows neiither relatablee fear, nor admirable bravery, but simply lacks the ability to understand the severity of the situation and the reader/listener doesn't want to see him succeed due to his bad character and his obvious inability to reign a country, the simplicity of how the conflict is resolved is in stark contrast to the elaborate attempts that preceeded it. All this is similar to how modern parodies work. It should be mentioned that tale is still pretty popular in Germany, but the modern retellings chane the tale pretty severely. The more gruesome scenes are omitted or edited, the protagonist is changed from agressive and unlikeable to a typical friendly underdog who's only character flaw is that he can't fear. While this makes the story loose some of its allurement, I think the original would probably be too dark for children today and it would be a shame to keep this truly fnny tale away from them completely, so I understand why those changes are made. By the way, this tale has also been covered in the german fairytale podcast "Märchenstunde" and the hosts drew a similar comparison to you. Instead of comparing it to junk literature, they drew their comparison to casting shows and reality TV, where participants are often humiliated for the amusement of the audience. However unlike those shows "The Youth Who Wanted to Learn What Fear Is", still shows that even the ones at the bottomof the barrel can achieve success when they learn how to utilize their talents. I also like this tale and its over the top situations and unlikely resolutions. And I'm all about light summer reading! Although I've been trying to make sense of the "In Defense of Rubbish" along with the fact that I think the quality of current children's entertainment is significantly lower than it was even 20 years ago. Disney channel shows aren't just goofy, they're embarrassing. Haven't read as many current children's books, but tv shows lack their ability to appeal to adults as well.